Red Hill (KH6/MA-001) is the tallest peak of Haleakala (“House of the Sun”) located in Haleakala National Park on the island of Maui in Hawaii. It is commonly called Haleakala even though Red Hill is the actual name of the summit. Red Hill is a drive-up, and a drive-up only. Visitors are not permitted to walk the extra 283 vertical feet on the paved road from the Haleakala Visitor Center at 9740ft / 2969m to the summit at 10,023ft / 3,055m. There is no shoulder on the road. There is also no trail to the summit, and walking off-trail is also not allowed. Directions: From Kahului where the main airport is, take Route 37 to 377 to 378. The drive is well signed. Driving time to the summit from Kahului is approximately 1.5 hours. The road has many winding turns, so consider allowing extra time, especially if you decide to get up early when it's still dark so you can arrive on time to catch the sunrise, which my husband and I did, followed by my activation at 16:00 UTC. This timing is good because Hawaii is three hours behind the West Coast of the mainland. It can be quite cold and windy at the top – hard to imagine when you’ve been hanging out at the beach. Cool So make sure you check the weather and bring warm clothes including a warm hat, gloves, and a rain/wind resistant shell. Weather and sunrise: http://www.weather.com/weather/today/l/Haleakala+HI+USHI0103 National Park Service website: http://www.nps.gov/hale/index.htm You can activate in the parking lot, but I decided to ascend a short path about 20 feet to a ridge on the northeast side of the parking lot where I strapped my vertical antenna pole to a signpost. My husband was kind enough to hold radial. Alternatively, if using a vertical, you could put your pole in a backpack on your back, and use the signpost to support a radial. I used 5W of SSB on 10m to make eight contacts as far as Texas and Minnesota. 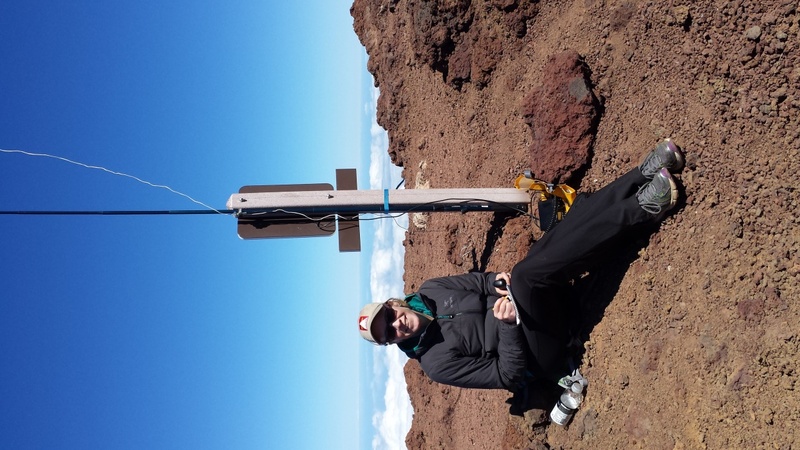 Others have worked 2m FM into Oahu from this summit. There were no park rangers at the top, but if they were to ask or challenge your activity, a good idea might be to have your ham radio license available. You might also say, “We’ll only be here for a few minutes.” “We won’t be moving or touching anything.” “We will be sure to stay on the trail.” I had heard that others who had activated Red Hill had been approached by concerned/curious rangers. After the activation, we did a short hike down the Sliding Sands Trail part way into the crater. It’s a magnificent view.